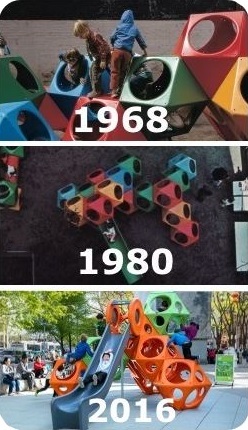 Bring a totally unique, immersive play experience to your playground with smart, innovative play design - ready for climbing, sliding, and discovering! Simple and irresistible, PlayCubes are based on the iconic creation of prominent architect/designer Richard Datter - redesigned for even more physical, social and cognitive play value and engagement. Branch Out mimics the natural way children play on a tree. Vertical and horizontal climbing, unique rope angles, and a hammock area make this unlike any other rope climber on the market! Playform 7 is "Playground Meets Sculpture!" With Playform 7, you have a unique visual appeal that allows kids to play like they never have before. 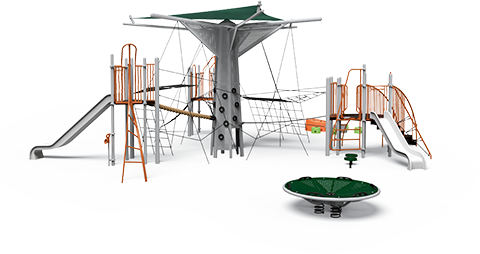 Featuring Playworld's durable flex tread, kids can run, bounce, traverse, and play in ways that will challenge them.